Flame Cutting Equipment offers the user state of the art technical excellence at very reasonable price. Specially made for the small and medium size industries, this machine cuts at costs far lower than conventional cutting methods, more economically and efficiently. NextGen Plasma offer you an advanced range of CNC Profile Flame Cutting Machines, Heavy Duty Flame Torch, Nesting Software etc. 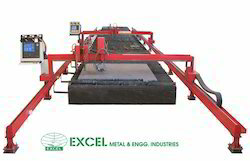 Our Flame cutting machines are highly accurate providing excellent cutting quality and low operational cost and convenient for placing in a production line for automation. TEJUS is a precision gantry type CNC shape cutting machine with robust structure suitable for high speed and accurate cut. It is ideally suited for cutting complicated profile in medium and heavy industries. Salient feature – for cutting higher diameter finished samples such as sections, rounds, square forging castings etc. Of ferrous material. With the help of the flame cutting machine fabri opticut you can produce your parts according to a drawing. The optical-electronic follower control traces the drawing and the parallel mounted torch is cutting the respective part. We are dealing in Portable Flame Cutting Machine. Owing to our expertise, we are manufacturing and supplying an extensive array of Flame Cutting Machine. The offered flame cutting machine is designed by using optimum quality material and updated technology. 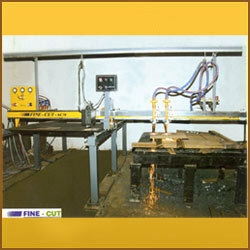 Our flame cutting machine is passed through various quality parameters by our quality experts make certain its quality. We are Leading Manufacturer & Exporter of Griflam Heating.